Michael Brauer (Epidemiologist in University of BC, Canada) says that air pollution is a known serious cause of number of health effects. 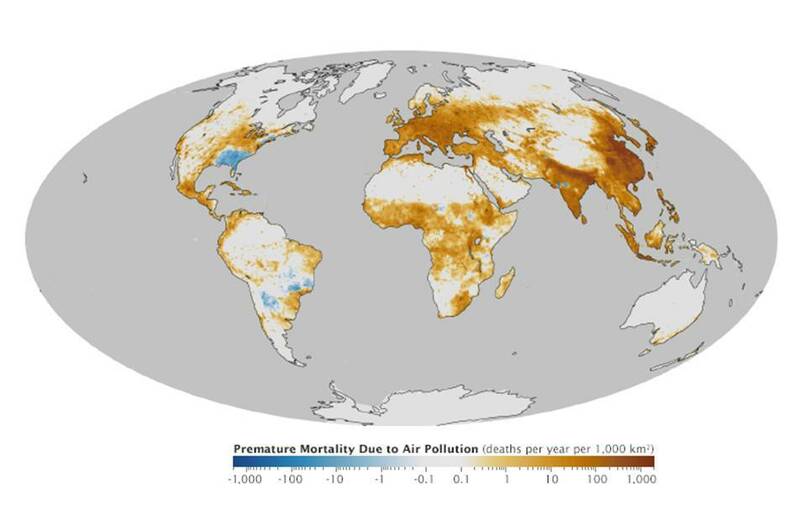 Check below map to find mortality rate due to air pollution in your area. Particulate matter or particulates (PM) are mixture of small solid particles and liquid droplets present in the air. Typically particulates are formed when dust, metal or soot particles come in contact with water or acids in atmosphere. This is there small size which makes them so much dangerous. As per Environmental protection agency (EPA) of USA, there are two types of particulate matters based upon their size. 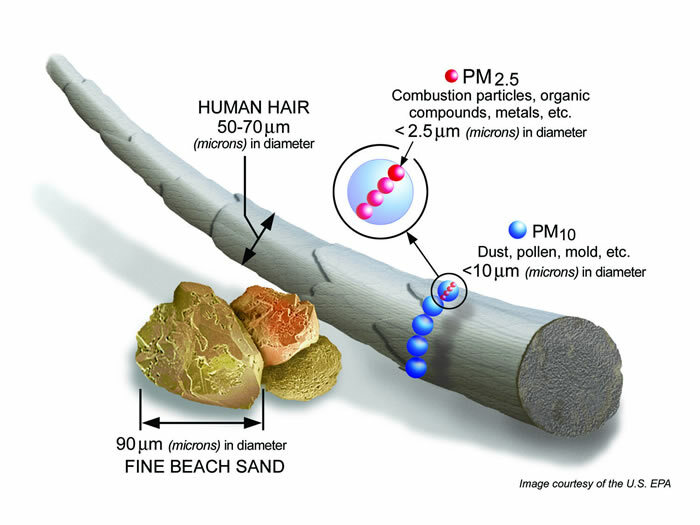 Particulates smaller than 10 mm but larger than 2.5 mm are inhale able coarse particles. These are mostly found near highways, cement industries and other such dusty areas. Particulates smaller than 2.5 mm are named as fine particles. These are usually emitted from sources like forest fires and power plant emitted gases. These small particles looks quite harmless but they do more damage then we think. Human has natural prevention system to avoid entry of particulates in human body by inhalation. Nose hairs act as filters to avoid solid particles entry but particles smaller than 10 micron can pass and enter in human lungs, where they cause serious damage. For children, heart and asthma patients these symptoms can be even more serious and have long term impacts including non-fatal heart attacks and decreased lung function. Studies has revealed that fine particulates (PM2.5) are more hazardous than Inhale able coarse particulates (PM10) due to presence of poly aromatic hydrocarbons and other organic compounds. World health organization consider the impact of particulates. There is no safe threshold but WHO has guideline values to minimize the exposure of these particulates. But unfortunately, most of the metropolitan’s areas of the world has high concentration of particulates. To find real time air quality data of your area visit this real time air quality index (AQI) data. This data includes PM2.5, PM10, NOx and other pollutants concentration. Click on the image. Recent data gathering revealed increase in particulate matters concentration. As they are produced from coal burning and other industries. Currently such industries are wide spread. Specially developing countries of Asia are at high risk and remember about 75% population of world lives there. World leaders not only need to consider this risk but also take serious actions to minimize the hazard. It is really essential to make world a safer place for our future generations. If you consider it a serious issue then raise your voice by sharing this and Let us know about particulate matters concentration in your area in comments.